Samsung Galaxy S4 has become a series and it may even become a larger series if we get a Galaxy S4 Plus/Galaxy S4 Ultra model as rumored. Luckily Bob Freking was ready to create such a device and imagined it as the concept below. This model brings together the features of the Galaxy S4 Zoom, S4 Mini, S4 Active and the leaks regarding a Snapdragon 800 S4 version. 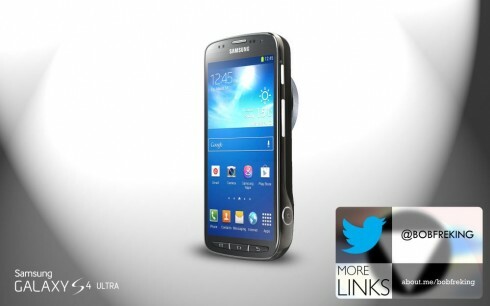 All of them together create the Samsung Galaxy S4 Ultra, that packs a 5 inch Super AMOLED 1080p display, a Snapdragon 800 processor, LTE connectivity and Adreno 330 graphics, as well as 2 GB of RAM. I’m guessing we also get the brand new LTE-A standard here and at the back we’ve got that huge 10x optical zoom 16 megapixel camera with Xenon flash and the usual waterproofing and dust proofing from the Active model. Aqua mode shooting is included as well and if it weren’t for the bulk, this would be a must buy, probably at an obscene price.